#AthleteTrainingLog: Who Uses an Exercise Training-Log? 1908 - "The most famous distance runners of the first decade of the century (left to right) Alfred Shrubb of Great Britain, Tom Longboat of Canada, John Hayes of the USA, winner of the 1908 London Olympic Marathon, and Dorando Pietri of Italy"
For more than 110 years, athletes have been recording their information from their exercise workouts. The first signs of this practice can be dated back to English runner Alfred “Alfie” Shrubb (12 December 1879 - 23 April 1964) who kept detailed notes of his training in dairy format as a professional runner. Some athletes record various details of their exercise workouts, health, meals and assessments each day and over a period of time. These measurements are usually kept in a diary, log or journal written format. In the past century books were published that allowed athletes to record their information in a training-log format that was sport specific. These books included a series of daily pages for the year with templates on what information should be recorded, from the author’s perspective. In the early eighties, as personal computers were being introduced, some athletes started logging their information in early versions of spreadsheet software. This is still one of the most commonly used formats for recording information about athletic workouts today. Over the same period of time, during the personal computer revolution, sport-specific training-log software packages started appearing in desktop formats. In the late nineties, some athletes started using online training-logs when the Internet evolved to include databases that allowed users to store information online. Since 2008, the explosion of apps for mobile phones has seen a new set of training-logs enter the market place. The definition of a “diary” implies somewhere you keep your secrets which might still be appropriate for training-logs; elite athletes may be very concerned about their training data being shared with their competitors . While the idea of recording your exercise workouts has been around for more than a century, what hasn’t been clear is what information an athlete should record from their workouts that will actually help improve their athletic performances. The information fields appearing in training-log books, spreadsheets, and online training-logs in the market, varied quite a bit from each other - thus leaving the athlete confused as to what’s the best way to record an exercise workout and what value it has for that athlete’s training. Many articles have been written on the benefits of keeping a training-log for the purpose of reviewing data for self-coaching and monitoring injuries. In my experience, I found the athlete training-log to be a one-way training tool that athletes often stop using after a period of a couple of months. While I was monitoring a group of athletes’ training habits, I found their general consensus to be one of “What’s the point?”. Athletes in general were not crazy about the idea of having to record all the analytical data from their workouts, health and meals each day if there was no visual value to them. It was as if they did not see value in it or understand the connection to their training. But the coaches and sport scientists were loving the same data from the athletes and wanting more. Even though there are an abundance of athlete training-logs, in a variety of formats, on the market today, a majority of athletes are not recording their training data in any form of diary, log or journal. And for those that are, most are only doing so at their coach’s request and wait for a reply based on the results from the data sent to their coach. I believe the future of the athlete training-log will be as a component of the athlete’s training that can be connected to a coach’s training planner for “planned” versus “actual” analysis. If an athlete is self-coaching or being coached by a professional, this combination of tools will be the evolution of the electronic exercise training software, a tool that allows an athlete in any sport to measure the effectiveness of the previous day’s exercise workout….with or without a coach. This might encourage the large percentage of athletes not recording their exercise workouts today to change. If the athlete can get a computerized output of their previous day’s workout effectiveness it might intrigue them to enter the data required to obtain the core results. This is a sample from the PEAK iBook. 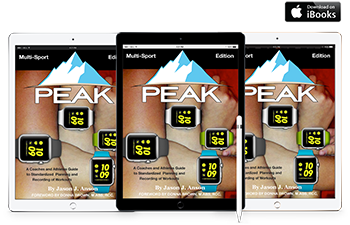 The rest of this chapter can be read in PEAK iBook available on the iBooks store.